One of the most interesting topics in the offseason just prior to the start of the 2011 season was the talk about the pitching aces that the Phillies have on the team and who would be the pitcher or pitchers to win 20 games this season. The Phillies came to Spring Training with Cliff Lee, Cole Hamels, and Roy Halladay, and Roy Oswalt. Fast forward to August 2011 and now we have a better picture about who is in contention to win 20 games for the Phillies. The first candidate would have to be Roy Halladay. Halladay mezmorized the competition last year and reeled off 21 wins last year for the Phillies, finishing off his season at 21-10. Halladay also picked up his second Cy Young Award of his career in the process. Cliff Lee isn't far behind at 12-7. Lee could easily run off 8 more wins to have 20 wins as well. He won all his games in June. Roy Halladay is off to another great run at the 20 win mark and possibly in contention for the 2011 Cy Young Award with his NL league leading 15-4 record and 2.51 ERA so far. 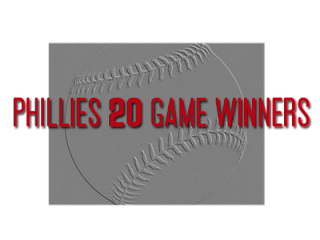 Right on Halladay's heels is Cole Hamels at 13-6 with a 2.53 ERA. They both have a chance to win 20 games this season. 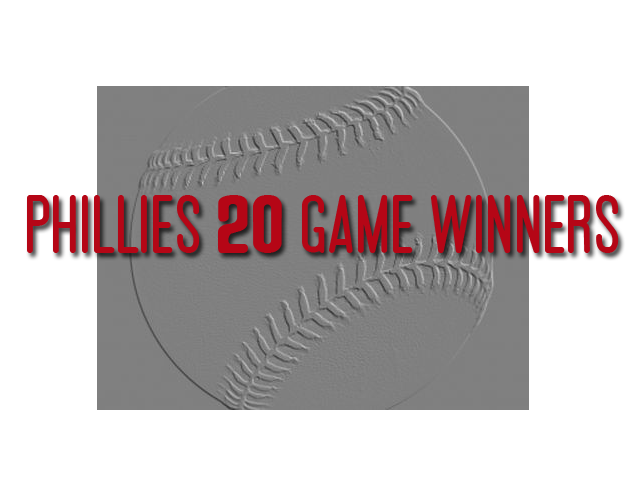 The highest number of wins in a season since 1969 for the Phillies belongs to Steve Carlton. He won 27 games in 1972 for the Phillies. Carlton started 41 games and pitched 346.1 innings that season, of course he won the Cy Young for the first time in 1972 behind that season, and he would go on to win the Cy Young a total of 4 times in his career. Interestingly, Carlton's Cy Young Awards stretched out through his whole career, he won the award in 1972, 1977, 1980, and 1982. Carlton also posted a 1.97 ERA in 1972 and struck out 310 batters which was the most Carlton ever struck out in a single season.